I Made It is a website where you can buy handmade & home-made stuff from talented folks all over the country. Make cool products yourself? You can sell them here as well. If you’re always on the lookout for cool, offbeat products that aren’t easily available in the market, this website will be your go-to from this point forward. I Made It is an e-store where people can showcase and sell whatever quirky and unique products they make at home. They’ve got four categories—bakery, design, gifts, and beauty—and each of them have products that’ll have you repeatedly clicking the ‘add to cart’ button. 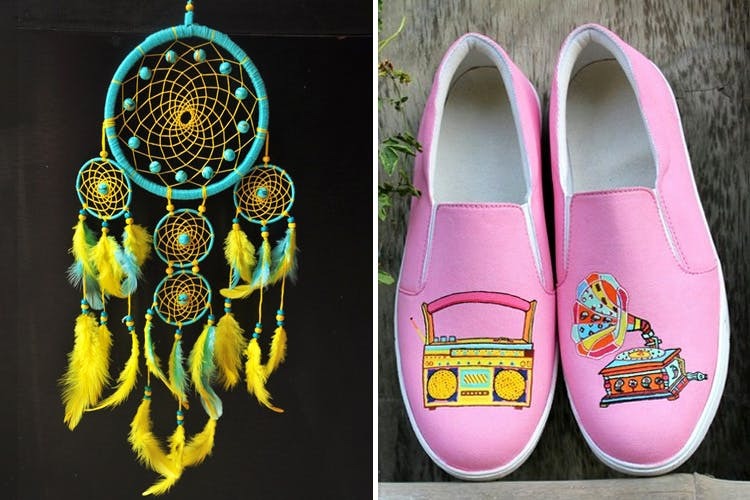 You’ll find stuff like hand-painted shoes, doodled-on envelopes, feathered earrings, origami rugs, personalised charcoal portraits, and so many other cool things. You’ll also find customised boxes and cards for gifting, dog soaps, minion cakes and other stuff. If there’s a fun product your talented self can make, this is the perfect platform to showcase and sell it at. Just make an account, upload your product, complete some basic formalities, and voilà—you’re the creator now. Doesn’t matter if you’re a baker, an origami expert, or a figurine enthusiast—these guys say if you’ve got it, flaunt it (and sell it). We’re probably going to be stuck scrolling through the cool finds on this website for days and we suggest you do, too. Check the I Made It website for more info.